Looking for a San Diego Tai Chi Chuan Instructor: Siu-Fong and Jing Jing are the best since they have been honored by English and Chinese Newspaper and Magazine as the Queen and Princess of Tai Chi Chuan in the USA. Tai Chi Chuan forms that we teach are based on the Beijing Standard and recognized by the Chinese Wushu Association and the USA Wushu Kungfu Federation. October 16-20, 2004 This is a tough competition. Each competitor was allowed to compete 2 events. Jing Jing compete the Wudang sword and Sun Style Tai Chi (Taiji). She won Gold and Silver (first price and second price)! During our stay with the USAWKF Team, Jing Jing and Siu-Fong have been interviewed 4-5 times in China TV and newspaper. What a Trip! July 26 - 27 2003. the only San Diego Tai Chi competitor, Jing Jing participated in 8 internal Tai Chi events: Yang, Chen, Wu and Sun styles competition routines, 24-form Tai Chi Chuan (taijiquan), 32 & 42-form Tai Chi (taiji) sword and Mulan Fan. She won 6 gold , 2 silver and the Internal Grand Champion Cup. This tournament marks Jing Jing's 8th Grand Championships. A GREAT Record! Jing Jing was invited to perform on Master Demo on Saturday night. Her performance was highly commented upon by many famous masters from China. Her mother and coach Siu-Fong Evans is very proud of her! 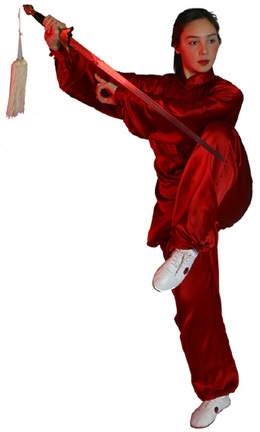 April 6, 2002. the only San Diego Tai Chi competitor, Jing Jing participated in 6 internal Tai Chi events (Yang, Chen, Wu and Sun styles Tai Chi competition routines) and two weapons (sword and fan). She won gold for all 6 events and the Grand Champion Cup. September 1-2, 2001. This was a small tournament put on by Beijing Wushu Team member Li JinHeng. Jing Jing won eight gold medals plus the Internal Women's Grand Championship. August 9-12, 2001. Lui Guojing Evans (Jing Jing) competed in 9 Tai Chi events and won 6 gold, 2 silver and 1 bronze medal, plus the Grand Champion Cup in Yang Chen Wu Sun Styles and international competition Tai Chi routines. Athletes from over 30 countries, including China and Hong Kong, gathered here for friendship and competition. This marked Jing Jing's 5th Grand Championship in Tai Chi since March 2001. 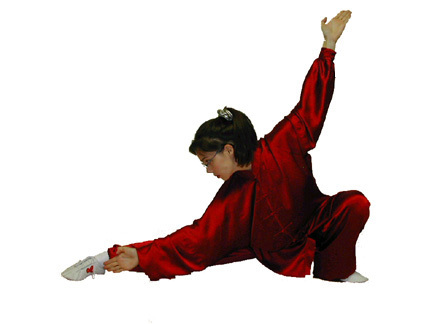 Due to her outstanding achievement, USA Wushu Kungfu Federation awarded her the title "Internal Athlete of the Year" 2001. Her mother Siu-Fong Evans is very proud of her. April 28, 2001. Jing Jing participated in 7 Tai Chi events, won 7 gold medals, and won the the Grand Champion Cup. She is honored as the Best San Diego Tai Chi Competitor. April 21, 2001. Jing Jing learned the perils of two different people competing two different Tai Chi sword routines in the same ring at the same time, won 2 gold and 3 bronze medals and the Grand Champion Cup. March 2-4, 2001. Jing Jing competed in all Tai Chi Chuan (taijiquan) and taiji sword routines, attempted to spontaneously create a Tai Chi (taiji) fan routine, and won 3 gold and 4 silver medals, and was proclaimed Grand Champion for Internal Forms. October 6-8, 2000. Jing Jing competed in most Tai Chi (taiji) events and learned a great deal about the importance of calmness and creative Tai Chi forms. Septmeber 2000. Jing Jing competed against her mother Siu-Fong and won all the silver and bronze medals in Tai Chi Chuan and Tai Chi Sword. It was a great first tournament.